This book was received free from the publisher for my honest thoughts and review. Saints and Non-Saints written by Christa Gingery Habegger copyrighted 2007. One of the places that you'll hear most about the Saints is around holidays or in church. You may even hear of a large amount of the Saints through art galleries and when learning about art, music and architecture. Pictures are often shown in stain glass windows in churches all over the places of worship. You even hear a lot through Greek Mythology of the Saints by legends that are foretold and passed on and through time. 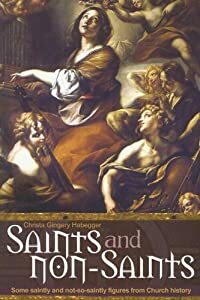 This is one book that will absolutely enlighten the knowledge of the Saints and show where some were Biblical Saints where others were not. Highly Recommended for anyone that loves to learn about history, Saints of those that want more information on the Saints after watching the Da Vinci Code.